It’s getting to be that time of year when it is dark a lot and thus not conducive to photographing candies and sewn items and the like. Oh well. 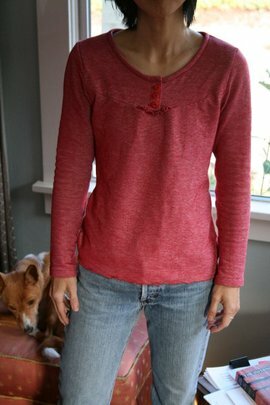 Anyway, after a long break from my sewing machine (these things just happen), I finally had a chance to sit down and crank out this shirt. It’s a ripoff of an anthropologie shirt that baby adopter Melissa owns. Hers is made of a more lightweight fabric and has cute little cap sleeves. I wanted a winter version. I got this fabric at the beginning of summer at the Fabric Depot outdoor sale. It’s a double-layer knit and is very cozy and warm. 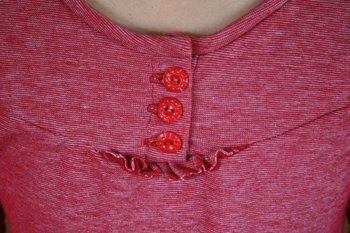 It is also on the thick side, which makes it kind of oddly clingy and made the placket a bit of a bear to deal with. The workmanship is not so great, but it is comfortable and casual, and hey, that’s my style (if you can even call it a style). I dig the mini ruffle. On a different note, yeah, my brother got me a bunch of pens in Japan, but I just placed a substantial order with my beloved JetPens. I don’t really know what is wrong with me, but I do come from a long line of hoarders. Maybe that’s it. Your shirt looks great, cute buttons! Tsk. My colleagues call me boring but that’s kinda what I would wear too. Freaking adorable! Nice work on sewing up that knit, I usually end up wonky on my seams. I love seeing all of the pens. It’s like living vicariously through bloggerdom (sadly, my holiday knitting budget ate my buy pens budget). nice shirt! and yum on the kisses. do you have any left? tiny ruffle rocks…sadly my evil job has blocked flickr so I am unable to check you out regularly and avoid working as much as I would like, but glad to see that you have returned to the sewing machine. great top i love the colour, as for the pens um is there such a place as pen hoarders anyonamous? You are a genius with that machine. This is simply adorable. Love this shirt! and it seems perfected fitted to you (in a not-super tight, good way). Is double-layer knit hard to work with?